LEARN ABOUT THE SHARI CARLSON STUDIO. CASTING DIRECTOR, DIRECTOR, COACH - SHARI IS KNOWN THROUGH OUT THE INDUSTRY AS THE INSTRUMENT COACH AND CONTINUES TO GUIDE, INSPIRE, LEAD, AND COACH. Shari began her own acting career in Hollywood in the Sixties. Self taught and street wise, she learned the ropes and experienced the struggles everyone goes through starting a career. She became the coach she always yearned to have. Each student is individually coached within the safe and supportive group and therefore quickly progresses in the craft. There is much to learning who you really are, and how to express yourself in the deep and personal craft of acting. The Joshua Cameron Scholarship Fund was created in 2009 to help provide funds for professional instruction to deserving applicants who passionately desire to obtain education in the performing arts. The Shari Carlson Studio awards scholarships for study. Recipients receive the highest level of training in the performing arts. SINA EIDEN AT THE SHARI CARLSON STUDIO. Email. . . So, I’m feeling exuberant and wanted to share. I had a callback for an HP Internet Commercial. Just got a "check avail." But the thing was, how I worked with myself and prepared for the audition. And I’m not talking about memorizing lines (which I had done). But really - WORKING WITH - myself. Yesterday was the first audition and it was amazing to sit in the waiting room and not dive into all of the talk in my head. There was a lot of silence (in my head) which was lovely. I went in completely liking and perhaps loving myself (I know it’s not a requirement) and it was fascinating to experience. I thought I had done well, but besides that, this new experience of just BEING in the audition was AMAZING. So, for the callback today, I figured, how will I recapture that? What if I can’t? And then I realized that however I felt would be ok. I took time for me in the morning and listened to my new meditation tape AND did morning pages. And, get this, I asked for heIp, didn’t have a babysitter, so I called a friend and asked if I could drop my son off to play with her child at her place. I ASKED FOR HELP!!! I put everything in place to make this a success and it was. Is. I sat in the waiting room at Beau’s (casting office) today for over an hour and a half before they saw me. There weren’t a lot of people; they were just taking a long time with everyone before me. And I just got it. That it’s not about the audition. It’s NEVER about the audition, but how you work with yourself. I didn’t know what they were going to have me do, so I didn’t waste time “preparing” and self directing beforehand. I just sat and breathed. And when women started coming in (it was just me and some men for quite some time), I didn’t get jealous, or judge them or me. I wished them well and thought of what you said. There’s work for us all. There was a moment or two when I thought I felt a weird vibe, and I told myself, “No one can judge you if you don’t judge yourself.” And that was that. OH MY GOD. Long email, but I’m feeling really grateful for my experience with you. For all the coaching and facilitating over the past many years. It all feels like it’s finally coming together and I’m really understanding things at a different level. I’m in heaven! You are a phenomenal coach. It’s an honor to work with you and now I am working honestly with myself. SHARI CARLSON COACHES ACTORS AND SINGERS.
" People often ask me what I do. I have always found it hard to describe. One way you may be able to understand what I do is to remember the story of Peter Pan when He first met Mary and had her sew his shadow back on. Your shadow, you see, is very important. I am a Sensitive and have a highly developed intuition. This gift serves me in assisting you while you create yourself to be who you really want to be. I have been described as a Healer, a Shaman and an Empath:"
Empathy is a highly prized virtue. It’s the ability to understand and feel the experiences of other people through their perspectives. Being an empath means you can understand and relate to other people’s feelings. It also means that you are affected by their energies and can understand what they are feeling. Intuition is a pre requisite for empathy. Empathy is an innate and intuitive quality not all people possess. Being an empath is much more than just being sensitive towards others. An empath feels the spiritual urges and physical sensitiveness of other people and are often capable of determining people’s motivations and intentions. You were either born an empath or weren’t. Many empaths are so sensitive that they can physically feel the pain of other people. They can experience the symptoms of other people’s illness and high emotions. You may also be subjected to chronic fatigue, or pains and aches which may go unexplained. It is a commonly misunderstood gift which is why most empaths are labelled as hypochondriacs owing to the frequency at which they keep falling ill.
Empaths are difficult to understand or relate to. They are extraordinarily capable of peering into people’s thoughts to analyze the intentions behind their actions, and share their feelings. Their ability to read body language and feel emotions give them the power to understand what the other person is going through. Empaths have different levels, the highest and most valued of which is known as ‘Heyoka’. Heyoka is a Native American word meaning “a sacred clown” or “fool”. The term is used to refer to those who are emotional mirrors to the ones around them. Heyokas show other people their faults and weaknesses while at the same time providing them ways to overcome them. Most Heyokas are born Dyslexic (thinking backwards) or breach (coming into the world backwards). A similar trait among most Heyokas is appearing younger than their actual age. Heyokas often receive backlashes for their gifts. But these aren’t inherently bad. The backlashes aim at something good always. Their intentions are never bad. Their basic motive is to help the people around them. If you feel angry or unhappy after leaving a Heyoka chances are they were highlighting those qualities in you. On the contrary, if you feel immensely loved and a sense of acceptance after visiting a Heyoka it may indicate that they wanted you to love and accept yourself for who you are. Through the mirroring of the Heyokas you may discover and begin to appreciate a part of yourself that you never knew existed. It may seem easy to run away from the entire experience or completely disregard it but Heyokas only aim at helping you overcome your weaknesses and problems. Heyokas are there to guide you in your journey. They feel both the joy and the pain that you’re feeling. Arriving to a Heyoka with an open mind and heart is the best way to gain from the experience. Do not be upset at the reflections. Instead use them to build yourself more positively. A Heyoka is beyond general wisdom and its energies are high and firm. If you’ve been feeling a little off lately or if you aren’t sure of what and why you are feeling they may know what would help you overcome it and heal even when you aren’t sure of it yourself. Embrace the gift you’ve been given by them and use it to help you grow. All classes at our Studio are private. We insist on a confidentiality policy at our studio. We address the most personal, and do not allow any public sharing about others work in the classes. Of course you may always share your excitement and progress. This is one of the many ways we achieve safety for the individual to explore who they are now and who they are becoming. I am a professional actress that found my way to the United States from South Africa. I came to San Francisco to find my feet in this new and foreign country and here I found Shari Carlson Studio. I am forever grateful and honor the process that was introduced to me to build my foundation as true artist and actress. 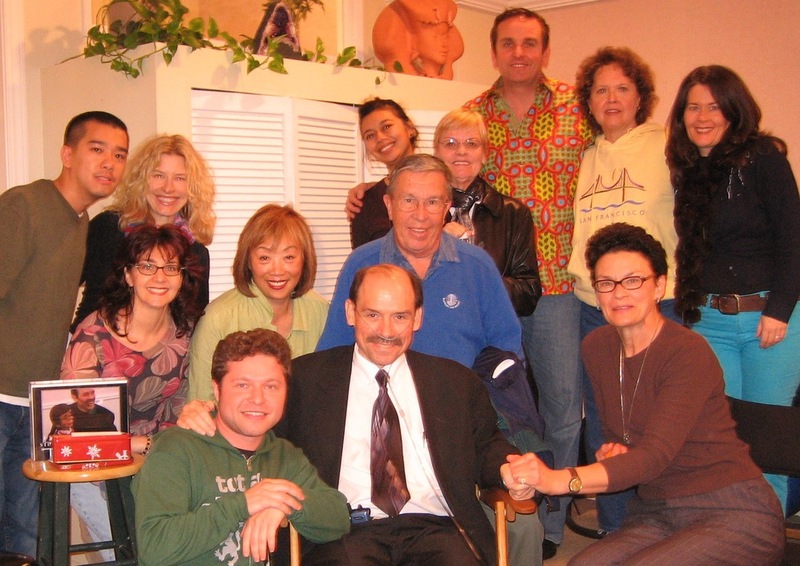 I did visit a few different acting schools and studios in SF and LA and nothing compares to what I found with Shari. She is an incredible teacher, coach and mentor that I trust with my craft and person. My artist has grown and I'm booking work. I have become a working actress in America and I have to admit that without the guidance of Shari Carlson I'm not sure this would be the case, I might not even be an actress today. Quinne B.
Shari is involved with every student on a one to one basis and the class atmosphere allows me to overcome my self consciousness that has blocked so much of my creative energy. Check her out if you are looking for a great acting or singing class. You will learn a lot more along the way! Jere V.
Since studying with Shari, my career has moved forward, my voice has expanded, my auditions and performances have improved, my grounding and confidence are gelling, my body is healing in unprecedented ways, and my work with text has accelerated and deepened. The self-care guidance and instrument development practices I've received from Shari have been spot on. Shari guides you to the right tools and resources at the right time to help you get the most out of helping yourself. Since studying with Shari, there has been a palpable shift in the function of my analytic mind. Perhaps a demotion from its point of view, the new role has definitely been in the best interests of the entirety of me. It's no longer in the driver's seat. It's no longer the first wrench I haul out of the tool box. It doesn't have to be satisfied for me to move forward, and it doesn't get to pass out grades to the rest of me. It has other work to do. Living is a lot more fun. Shari has helped me safely and successfully work with lifelong wounds, turning them into the very engines of my artistic and professional progression; portals of expression and authenticity, rather than fixed scars to work around or deny or escape. Works for me. Inda N.
Guided by an Elephant shares the personal journey of Acting Coach and Teacher Shari Carlson through the transformational process of becoming the Instrument Coach. This unique experience required the courage, vision and relationship of a powerful spirit animal. One class seemed extraordinary on Monday. The depth of feeling that moved the room, the camaraderie, the realness of the moment. I am sure there have been great classes for as long as I can remember, however, this class was truly special. Was it just Steven's story, his finding his long ago unbeknownst to him daughter, or rather her finding him? Is there some kind of energy that we all tapped into? We tried to recapture it. I tried everything I knew to repeat it. This must have been what Stanislavsky experienced and tried. Why he returned home from New York and threw out all his method. It--that special moment--can never be captured or repeated. You just get to live in the special moment now, if you would just notice. A testimonial. . . I started taking Shari's singing and acting classes about fifteen years ago, and have been in and out of her classes ever since. I initially took these classes as a way to "find" myself, and soon discovered a "me" I didn't know was there. My experience in her studio was both exhilarating and frightening--the perfect combination for profound work. Shari gave me all the space and safety I needed to explore the depths and crevices where my creative self likes to hang out. She is talented, intuitive, and supportive in all the right measures, which gave me the confidence to "go for it" even when I was scared out of my mind. My experience in her studio was inspiring and confidence-building, and caused me to embark on a creative path and career, which I am still on and will likely be for the rest of my life. I highly recommend working with Shari--both her singing and acting classes. She'll support you in going as far as you desire, but not push you beyond where your instrument is presently willing and able. You might discover parts of yourself that will shock you (in a great way) and you might find yourself looking for a whole new career in the process. Bill A.